Ebbetts Pass, named after John Ebbetts, (el. 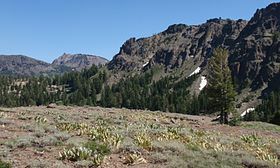 8,736 ft or 2,663 m) is a high mountain pass through the Sierra Nevada range in Alpine County, California. Ebbetts is the eastern of two passes in the area traversed by State Route 4. The western pass is the Pacific Grade Summit (el 8,050 ft or 2,450 m). The pass is registered as a California Historical Landmark. The Pacific Crest Trail, a 2,650-mile (4,260 km) long National Scenic Trail crosses State Route 4 at Ebbetts Pass. Ebbetts Pass was used by the Miwok and Washoe Indians in the area to cross the mountains, and it was most likely the route taken by Jedediah Smith in late spring of 1827 when leaving California at the end of his first exploratory journey, the first crossing ever of the Sierra Nevada by a non-native. The pass was later used by John Bidwell on his emigration to California. John Ebbetts, a California pioneer, traversed the pass in April 1851 with a large train of mules. He hoped it would make a suitable route for the transcontinental railroad, as he noted little snow at the time. However, this was likely an anomaly, as the current highway is generally closed from November through May due to snow accumulation. He later surveyed near the pass for a possible railroad route, but found it unsuitable. He intended to return to the pass itself to survey it for a road but was killed in the explosion of the steamboat Secretary on San Pablo Bay in 1854 before he could do so. While the pass was referred to by his name earlier, it was not until 1893, when the U.S. Geological Survey surveyed the Markleeville quadrangle, that the pass was officially named after him. The route was used only occasionally until silver was discovered east of the Sierra, and merchants in Murphys had a road constructed to Markleeville to more easily transport supplies over the pass to the miners. This became a toll road in 1862. From Markleeville, travel further eastward was taken along established routes. It was not until the early 1950s that the road over Monitor Pass to U.S. Route 395 was completed, connecting the eastern terminus of State Route 4 to U.S. Route 395 via State Route 89 near the community of Topaz. Ebbetts Pass was designated as a California State Scenic Highway in 1971 and was honored with National Scenic Byway status September 22, 2005 by the U.S Department of Transportation in Washington D.C. It is one of only seven nationally designated byways in California and 151 in the nation. Today, Ebbetts Pass is one of the least traveled passes in the Sierra Nevada. An extensive section of highway over the pass is less than two lanes with no dividing line. It has very steep sections with hairpin corners. The eastern slope is particularly difficult, as many of the hairpin corners are blind, and steepen suddenly at the apex, making it necessary to shift to first gear in most vehicles. It is rarely used by commercial traffic and is not recommended for vehicles towing long trailers. ^ "T 194". NGS data sheet. U.S. National Geodetic Survey. Retrieved 2012-06-23. ^ "Ebbetts Pass". Geographic Names Information System. United States Geological Survey. Retrieved 2012-06-23. ^ a b "Ebbetts Pass Route". Office of Historic Preservation, California State Parks. Retrieved 2012-03-30. 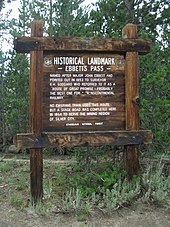 ^ a b "Ebbetts Pass History". Ebbetts Pass National Scenic Byway. Archived from the original on 2007-07-30. Retrieved 2007-11-26. ^ Hughey, Richard (1999-02-26). "Ebbetts finds pass to Angels Camp". Mountain Democrat. ^ Huber, Jane; Mai, Bill (2004). The Best in Tent Camping: Northern California. Menasha Ridge Press. ISBN 0-89732-580-X. Retrieved April 4, 2008. ^ "Winter Pass Closures". California Dept. of Transportation. Retrieved 2009-04-14. ^ Gudde, Erwin Gustav (2004). California Place Names: The Origin and Etymology of Current Geographical Names. University of California Press. ISBN 0-520-24217-3. ^ "State Route 89". California Highways. Retrieved 2007-11-04. ^ "Ebbetts Pass Scenic Byway". ^ Morey, Kathy; Thomas Winnett; Mike White; Stacy Corless (2005). Sierra North: Backcountry Trips in California's Sierra Nevada. Wilderness Press. ^ "Corridor Management Plan" (PDF). Calaveras Council of Governments. Retrieved 2009-12-16. Wikimedia Commons has media related to Ebbetts Pass. This page was last edited on 5 September 2018, at 20:30 (UTC).